The numbers 1 through 31 atop a snowflake. The snowflake measures 2 inches square. There are also 5 blank snowflakes so that special days such as holiday, birthday, or no school can be written on them. 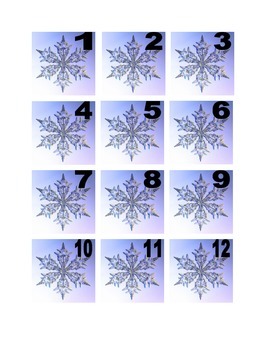 These can be used during the winter for calendar numbers or for a winter themed activity in a math center. If you like these snowflakes, you might also like my other calendar designs. Check out my leaves, sailboats, pumpkins, shamrocks, and more. If there is a certain shape you are looking for or you need a different size for your calendar, let me know and I'll be happy to put something together for you.